I've finally done some characterization of these muscles. My primary goal was to investigate the relationship between the diameter of the secondary coils and various muscle properties/behaviors. Materials: All muscles were made from Trilene Big Game “Solar Collector” fishing line (50 lb. test, 711 um in diameter), with a single heating element of 10/46 litz wire twisted in. Secondary Coils: I tried to cut the filament to a length that would produce the same number of secondary coils in each muscle when finished (ensuring all muscles would have the same length when at rest). Due to a lack of preciseness in my manufacturing methods, I could not get them quite the same, but corrected for this by reporting relative contraction distance instead of absolute contraction distance in the weight lifting results. Tension: I used the same 2 lb. weight as a load for each muscle during the coiling process. Unfortunately this does not entirely guarantee a consistent tension, because some of the nylon filaments were too long to suspend the weight for all or part of the coiling process – meaning it was acting as more of an anchor, and the force on the line would depend on the weight's friction with the floor as well. Secondary Coil Spacing: When coiling each muscle around its rod, I packed all of the coils as tightly as possible, so that the muscle would be fully contracted when at rest. Annealing: All muscles were annealed at a temperature of 300°F for 20 minutes. Chirality: All muscles were homochiral. 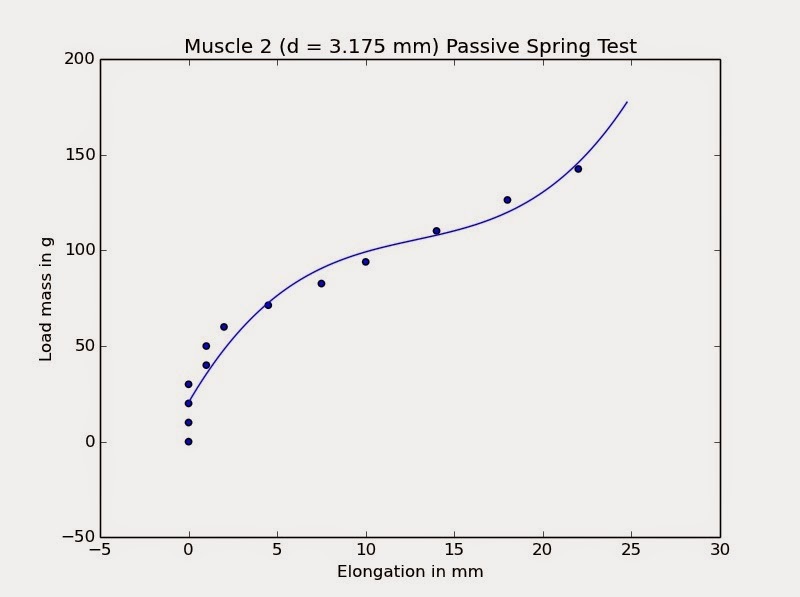 The passive spring constant test involved suspending various weights from a muscle and measuring the amount of deformation (stretching) produced. The muscles were not powered for this test. 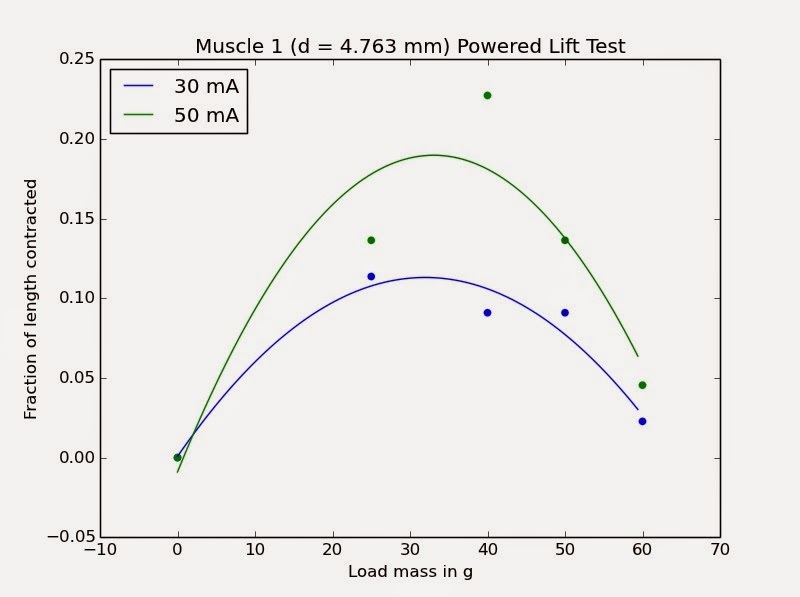 The weight lifting test was intended to measure each muscle's ability to lift weight under power. One muscle was tested at a time. It received its current through a power MOSFET switched by an ATTiny85 microcontroller. A multimeter was included in the circuit to measure current. I had programmed the ATTiny to read an analog voltage, which I could adjust by turning the dial on a potentiometer. The ATTiny sent a PWM signal to the gate of the transistor, varying the duty cycle based on the value of the analog voltage. I hand-adjusted the value of the potentiometer to get the same (effective) current value for each muscle. The distance through which the weight was lifted was measured at steady-state, after the load had risen as far as was possible for that current. Each data set has been fitted with a cubic curve. 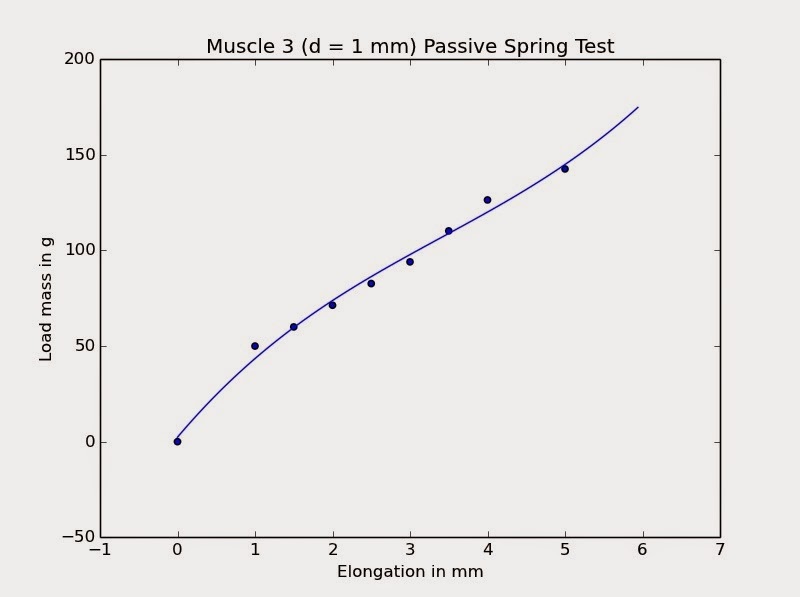 A spring constant can be obtained for each muscle by taking the slope of the linear portion of the curve. Each data set has been fitted with a parabolic curve. The (0,0) data point is assumed. 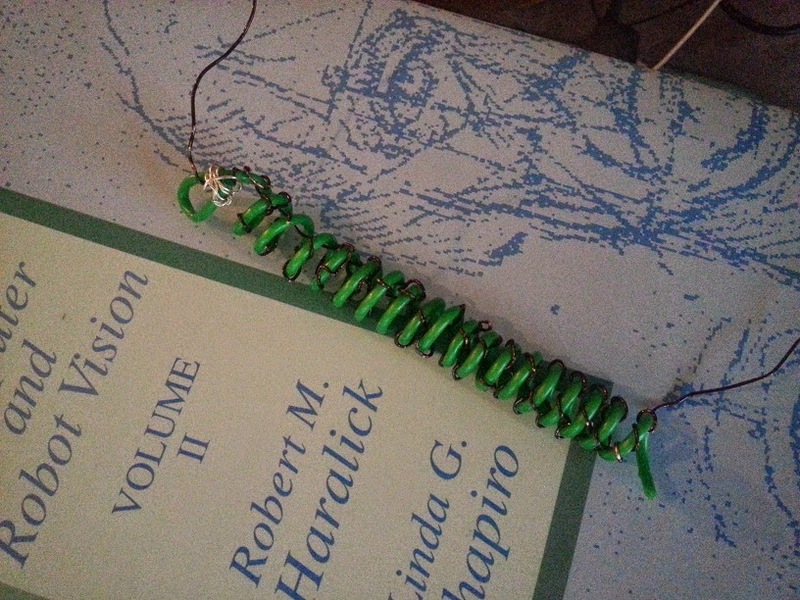 All else being equal, muscles with a smaller secondary coil diameter have a larger spring constant. Every muscle has an optimum load, a “sweet spot” on the curve, which allows for maximum lift distance when the muscle is powered. Too little weight doesn't stretch the coils far enough apart to provide a working distance, and too much begins to exceed the muscle's strength. I'm sure the optimum loads found for these muscles are dependent on the fact that they all have close-packed secondary coils. 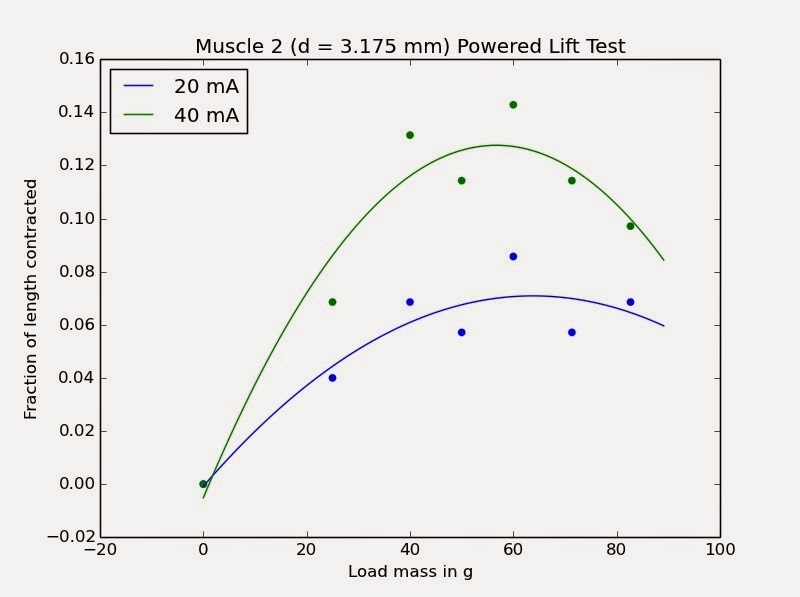 It would be interesting to re-try the experiment using muscles that are not fully contracted at rest, and thus have less need to be stretched by the weight. The size of the optimum load increases as the secondary coil diameter decreases. I don't know whether the optimum load is related to the amount of current as well, or is the same regardless of current; the data is too irregular to tell. At a given current, muscles with a large secondary coil diameter, lifting their optimum load, will lift higher than muscles with a small secondary coil diameter, lifting their optimum load. However, note that large-diameter muscles may have access to a smaller range of currents due to the risk of “going flat” (see yesterday's post). Q: Once you've made a muscle contract, can you continue to run current through it and hold it in position? A: Yes! Just be careful not to overheat the muscle. Current values that are tolerated in brief bursts may be enough to make the muscle flatten or go limp if they are applied for too long. Q: What is the advantage of rod-coiled muscles over self-coiled muscles, or vice versa? What is the best secondary coil diameter? A: The best diameter depends on your application. 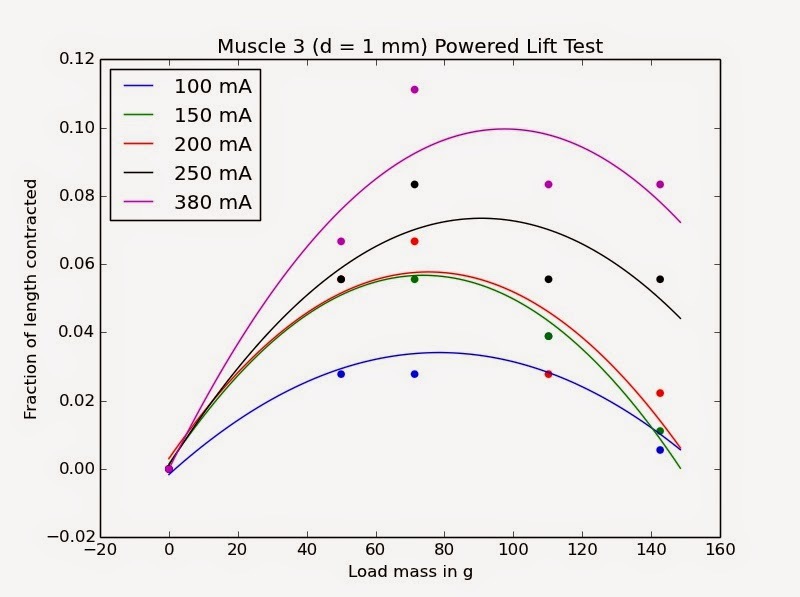 As I suspected, muscles with smaller diameters (including the self-coiled ones, which have the smallest diameter possible) can manage heavier weights, but can't lift them as far as large-diameter muscles can lift their optimal lighter weights (though I do wonder how the more tightly coiled muscles would perform if they were annealed with their coils spread out). The new revelation here is that diameter plays in to current requirements as well – large muscles working at their optimum point need less current than small muscles working at theirs. It's high time to talk about artificial muscles again. I have the long-awaited data from the Weight Lifting Test, but to keep this blog post from getting monstrous, I think I'm going to save that for tomorrow. Today's post will be devoted to a couple of side issues. Nylon artificial muscle: the giant edition. It's made of RINO-TUFF Universal Trimmer Line, manufactured by Jarden Applied Materials. The cross-section of this trimmer line is round (there are no ridges around the outside, as some trimmer lines have). The diameter is 2.0 mm, which puts the appropriate coiling load at about 5.45 kg (12.0 lb.). 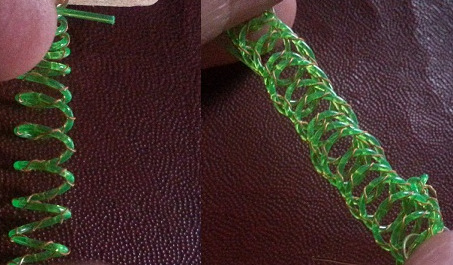 After initial twisting, I wound it around a 6.35 mm (0.25 in.) rod and baked it in the toaster oven as usual, though I let it go almost half an hour to make sure it was fully set, since the line is so thick. The heating element is a single enameled copper wire, I would guess 22 gauge. During my first quick test, the super-muscle lifted 0.454 kg (1 lb.) of dry beans about 1.5 mm. That may not sound like a very impressive distance given the size of the muscle, but it's more than I would expect my other muscles to do with that much weight. It's also possible that the heating element I used was a hindrance; single-stranded copper wire at that thickness has a noticeable springiness of its own that gives the muscle an additional resistance to motion. A more flexible multi-stranded heating element would be preferable, but I haven't tried to make better versions yet; I mainly wanted to see if the trimmer line would respond. Since it seems to be a viable muscle material, I hope to make more of these big guys, and will of course let you all know how that goes. When rod-coiled muscles are overheated, well before the line melts through they will usually “go flat.” The coils tilt into the plane along which tension is being applied, ruining the muscle's effectiveness as a spring. Something I have been noticing during recent tests is that certain muscles seem to be more prone to going flat than others. Take as an example the one on the right below, which was originally going to be the largest diameter muscle in the Weight Lifting Test … until it spontaneously went flat, while hanging vertically without any load on it, when my apartment got particularly hot one summer afternoon. The other muscles hanging up beside it were not similarly affected. A healthy rod-coiled muscle (left) compared to a ruined flat one (right). The muscle that went flat was the largest member of the set, so I thought that perhaps rod-coiled muscles with a larger diameter were more prone to flattening. However, when I started working with the remaining muscles in the Weight Lifting Test, it turned out that things weren't that simple. 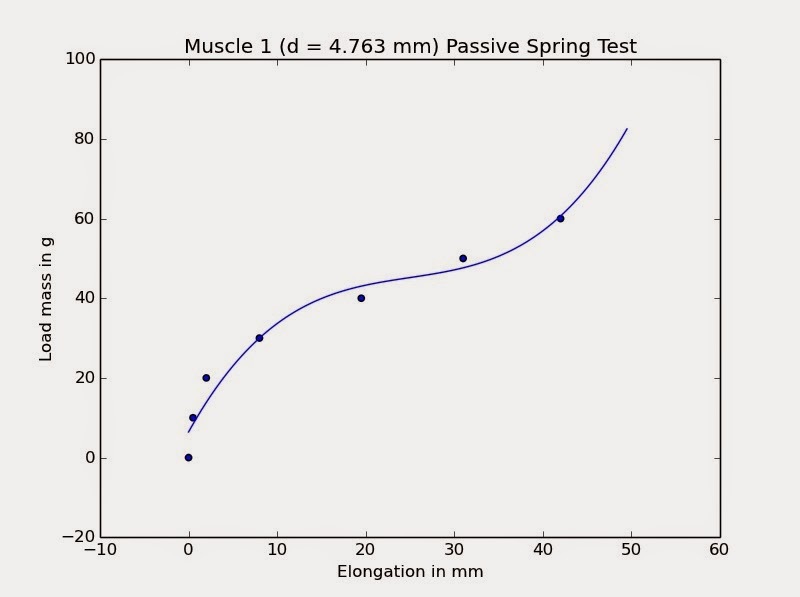 Of the three muscles, the 1/8” muscle seemed the most prone to flattening (which is why, in the data coming tomorrow, you'll see me using no currents larger than 40 mA for this muscle … it could barely take that much). It was at least as sensitive to high temperatures as the larger 3/16” muscle, if not more so. 1) Amount of tension applied via primary twisting before the muscle is coiled on the rod. I tried to keep this the same between muscles by using the same load and twisting each one for an amount of time proportional to the length of the line. Nonetheless, it's quite likely that they have small differences. I sometimes had to stop early because the line started forming secondary coils before time was up, or appeared about to. 2) Ambient temperature in the environment during primary twisting. I didn't make all the muscles on the same day, so there could be some differences here depending on what the weather was doing. 3) Amount of tension applied during secondary coiling, i.e. initial tightness of coils around the annealing rod.